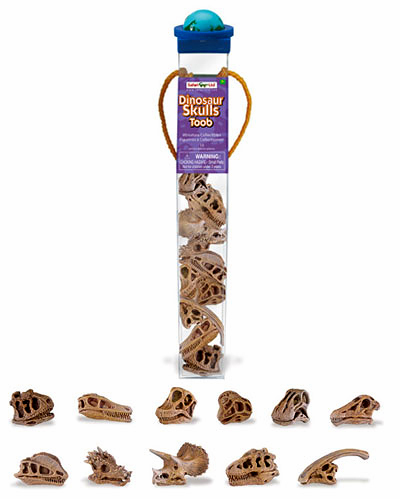 This surpassed our expectations – it has nicely detailed skulls of 12 different dinosaurs, all about 1.5″ to 3″ long. The dinosaurs represented are: T.rex (of course! ), Nigersaurus, Dracorex, Oviraptor, Velociraptor, Brachiosaurus, Diplodocus, Dilophosaurus, Triceratops, Parasaurolophus, and Carnotaurus.